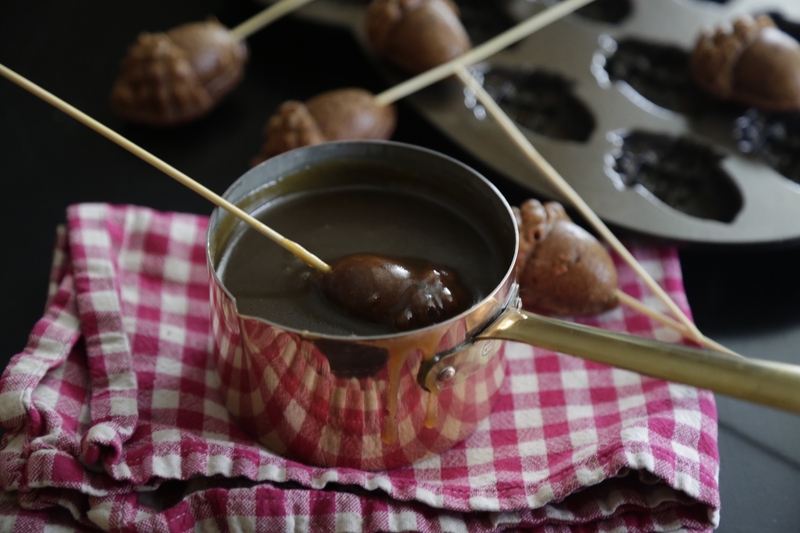 Sit around a bubbling pot of this boozy, spicy sauce and dip these acorn shaped gingerbread into the sauce. If you don't have this specialty pan just make it in a 9 by 13 sheet pan and cut the cake into cubes. You can serve this sauce over ice-cream, with toasted nuts or gingerbread cake and custard. 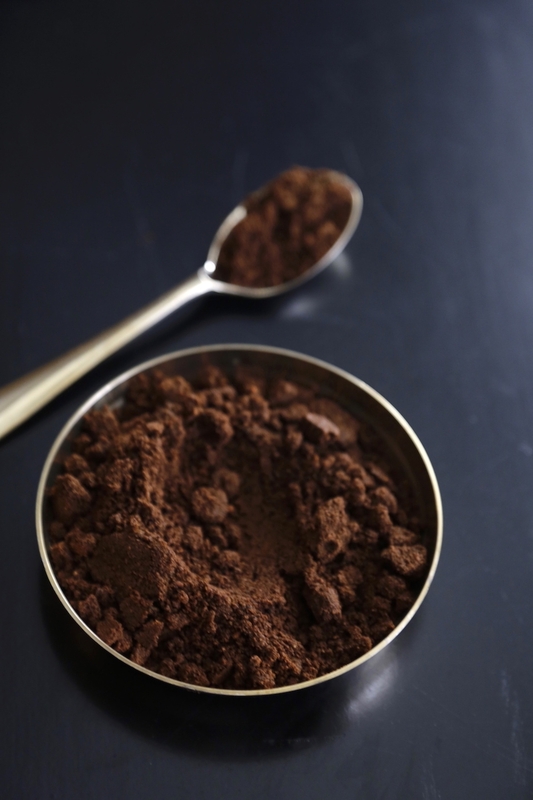 If you plan to serve it with ice cream you could stir in a 1/5 teaspoon each of ground cloves, cinnamon and allspice. COMBINE ALL THE INGREDIENTS EXCEPT THE RUM AND COOK IN A HEAVY BOTTOM SKILLET ON MEDIUM HEAT UNTIL BUBBLY, THICK AND REDUCEd BY ABOUT 30%. SWITCH OFF FLAME AND STIR IN RUM. POUR INTO YOUR FONDUE POT AND SERVE WITH GINGERBREAD. Methkoot is a classic semi- dry spice mix from Maharashtra with a long list of ingredients. Methi- refers to dried fenugreek seeds, which is the main flavour of this spice mix and koot in Marathi mean ground or powdered mix. Methkoot contains no coconut, garlic or onions and is traditionally eaten with steaming hot rice and ghee, with white butter and poles or thalipeet or served as a condiment in a thali.A flavourful combination of roasted lentils, grains and spices you can also mix it into clam fritter batter, Karwari sambhar lentils I also add it to dals, sautéed vegetables, yogurt and even pea and potato pattice while kneading the potatoes. The ingredients of methkoot must be dry and at room temperature when they are ground. If you must wash your lentils, rice and wheat be sure not to soak them and to drain and dry them throughly before roasting them. I buy my grains commercially packaged is I can avoid washing them. Methkoot refrigerated can keep for 6-8 months. Methkoot is said to aid digestion and if an old housewives tale is to be believed boosts the immunity system. remove any large fibres from the spices and seeds and any chaff from the grains. If your grains are clean do not wash them. If you do wash them drain immediately and let dry completely before you grind them. Roast the wheat and rice grains in a dry skillet on medium heat for about 15 minutes, till golden. Add the dals to the same skillet and roast them on medium heat for 6-8 minutes till golden. Add the remaining ingredients, except the oil, mustard seeds, asafoetida powder, salt and sugar to the same skillet and roast them on medium heat, till fragrant and golden. Set aside to cool completely. Grind the cooled grains to a fine powder. This spice mix should not be grainy so grind it repeatedly in small batches, then mix the batches up and grind again. A coffee grinder or a specialised spice grinder is suitable. Put the oil in a small pan on medium heat. When hot, sauté the mustard seeds and asafoetida powder for about 60-75 seconds until fragrant and bubbly. Cool completely and add the contents of the pan to the powdered mix with the salt and sugar and grind again to a very smooth consistency. The oil will make the mix a little damp but that is fine. Taste for salt and adjust. The mixture must be slightly salty as it is eaten with plain, unsalted, boiled, white rice. However if you plan to use it as a spice mix you may want to under salt it so you can add salt to your taste. While we use a small amount of sugar this is not a sweet spice mix so add sugar very carefully, only to heighten the flavours. Store in a clean, dry airtight container. Refrigerate for up to 6 months. Also known as a boiled frosting this is a traditional frosting used on red velvet cakes. Heat 1/2 cup milk and slowly in a small skillet dissolve the milk and flour to a smooth paste. Add 1 cup milk and stirring constantly bring to a boil and cook until you have a thick smooth paste like a béchamel. Remove from the fire and stir in remaining half cup milk and continue to stir. If you are unable to get all the lumps out process it in a blender. Any bits of flour will make the frosting lumpy. Whisk in vanilla and salt. Pour into a bowl to allow it to cool about 15 minutes then use plastic wrap to cover the surface. Press the wrap down over the frosting to prevent a skin from forming. Chill. Remove the cold frosting from the fridge and using a stand or hand mixer beat until the mixture is smooth. Then add the butter and beat again until well incorporated. Add the icing sugar and beat until fluffy and glossy. and looks like white buttercream frosting. If you live in a warm climate return the frosting to the fridge for a while to thicken up and then frost your cake. Otherwise ice your cooled cake immediately. Remove 1 cup icing and reserve. Keep refrigerated if you live in a warm climate. Brush excess crumbs or broken bits off both the cakes. Reserve them. 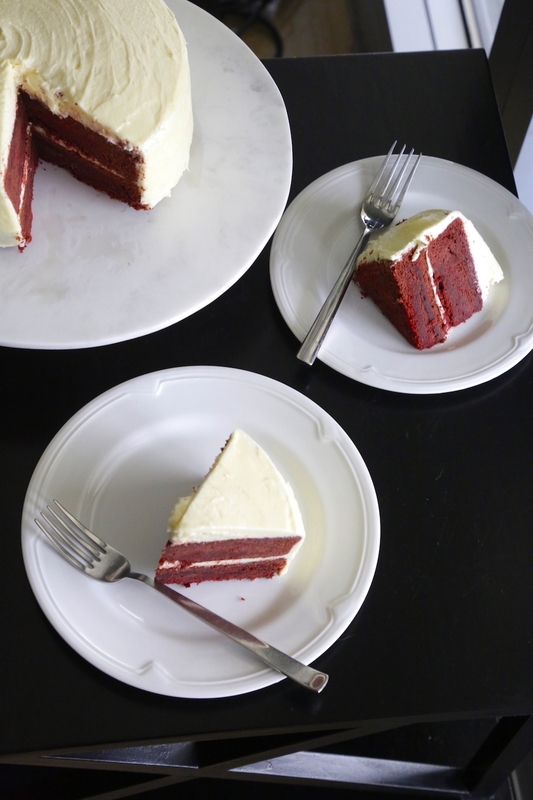 Place one cake on a flat clean surface or a serving dish and layer the top with 3/4 cup frosting. Sprinkle any crumbs over the frosting if you like. Place the second layer over the frosted cake. Frost all over until completely covered and smother using a long flat icing spatula. Clean you spatula. Then take the reserved frosting out, stir and apply to an areas of the cake where the frosting is uneven, has bits of red crumbs visible or has thinned out. Chill the cake for 1 hour to allow the frosting to set. If you have a lid that can cover it use it other wise keep it in the fridge away from anything string smelling. Khandeshi masala is a variant of the Puneri Goda Masala (find recipe here http://www.taradeshpande.in/gode-or-kaala-masala/ and has Mughal influences in that it uses khus-khus, green cardamom and nutmeg. It also contains sunth (dried,powdered ginger) and turmeric. Unlike Goda it doesn’t imply sesame seeds. But all kala masalas have dagadphool and dried lichen flower in common. This ingredient is a must for this recipe. Khandesh is a central Indian district in Maharashtra and shares a border with Madhya Pradesh. It has a very rich culinary history as it was first ruled by Rajputs, followed by 4 centuries of rule by the Delhi Sultanate and the Mughals. This was followed by Maratha annexation and finally British Rule. Khandesh since has been divided into 3 districts in Maharashtra state. Khandesh’s Khada masala is another famous spice mix also known as Maharashtra’s garam masala. Khandeshi masala is used to make chicken and mutton curries. It is also used to cook various sautéed vegetables. Roast the coconut in a dry, thick bottomed cast iron skillet on medium heat until golden brown. Reserve in a large bowl and let cool.Add the dried ginger and ground nutmeg to the coconut and stir well. In the same skillet heat a teaspoon of oil roast the fresh chopped turmeric until fragrant and dry and add to the bowl of coconut. 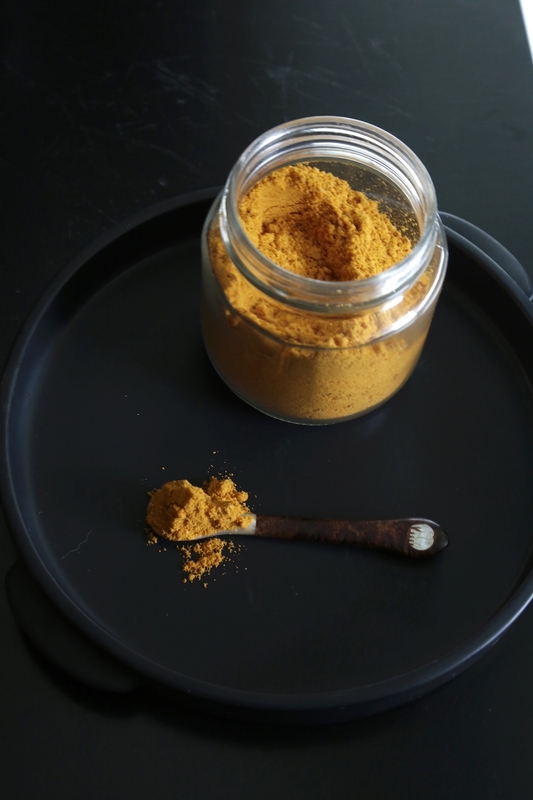 If using dried and powdered turmeric skip this step, just add the turmeric to the coconut. Heat one teaspoon of oil and roast the asafoetida until fragrant. Do not burn the asafoetida. If it starts smelling acrid start again. Add to the. coconut and reserve. Roast each remaining spice and seed separately in the skillet without oil for the first 2-3 minutes. Then add a half teaspoon of oil and roast lightly until golden and fragrant. Add to the bowl with remaining ingredients. Combine all the ingredients in the bowl using a large spoon and return to the cast iron skillet and roast on low heat for 2 minutes. This will evenly distribute the powdered nutmeg, turmeric, asafoetida and ginger and allow the flavours to meld. Keep the heat low so as not to burn the turmeric and dried ginger. Switch off the flame. Stir for another minute so heat dissipates then transfer back to heat proof bowl. Cool this mixture completely then grind in batches to a smooth fibre less consistency. This process will take 12-15 minutes or longer. Once you have ground all the batches mix them up and grind again to ensure that all ingredients are evenly mixed. You will have a dark brown, clumpy, thick, even sticky masala depending on how much oil was released by the Add salt to taste. Some cooks do not add salt- this way they can add salt to every dish they use this spice mix in separately. Once cooled, transfer the masala to an airtight jar. Store in a cool dry place or best keep refrigerated and it will last a year. Scrape off bits every time you want to use some with a dry spoon and return to the fridge.